The Roundtable discussion on Child Labour Free India was organised by Global March Against Child Labour in collaboration with its core partner Bachpan Bachao Andolan (BBA) bringing together Mr A C Pandey, Joint Secretary, Ministry of Labour and Employment, Mr Suresh Kumar, Joint Secretary, Ministry of Home Affairs, Dr Parveen Kumari Singh, Director, Ministry of Home Affairs, Dr L Mishra, former Labour Secretary of India, Mr U Saratchandran, Member Secretary, National Legal Services Authority, Ms Nina Nayak, Member, National Commission for Protection of Child Rights (NCPCR), Mr Ravi Wig, Council of Indian Employers, representatives from the labour department of Delhi, representatives from ILO, UNICEF and UNESCO, representatives from grassroots child rights organisations in India and eminent social scientists. The roundtable discussion was organised for the key and strategic stakeholders of the civil society to brainstorm and provide concrete suggestions to the Ministry of Labour and Employment and other relevent ministries for a comprehensive and convergent child labour rehabilition and eduation policy in light of the Union cabinet’s approval for amendments in the child labour law, making child labour a crime and banning all forms of child labour till 14 years, and prohibiting the employment of adolescents between 14–18 years in hazardous work. 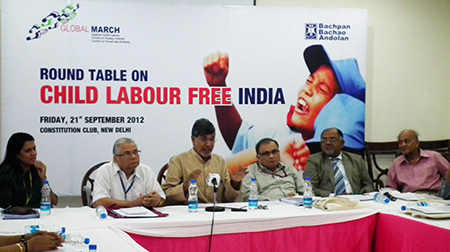 This roundtable disucssion follows the two-days National Consultation on Child Labour Free India in on 11-12 May 2012 inaugurated by Minister of Labour and Employment Mr. Mallikarjuna Kharge. Ensuring convergence with all the relevant ministries, department and governments schemes to ensure prevention, protection, rehabilition and education of child labour.